Events around the recent election in Zimbabwe are evidence that transitional justice is needed before true political reform can take place. President Ramaphosa of South Africa and Mnangagwa of Zimbabwe at the 10th BRICS summit in 2018. Image credit the Government of South Africa via Flickr. Nine months ago, I penned a commentary piece on the uncertain future of transitional justice in Zimbabwe following the so-called “bloodless coup” that removed from power president Robert Mugabe after 37 years and installed as interim president Emmerson Mnangagwa. 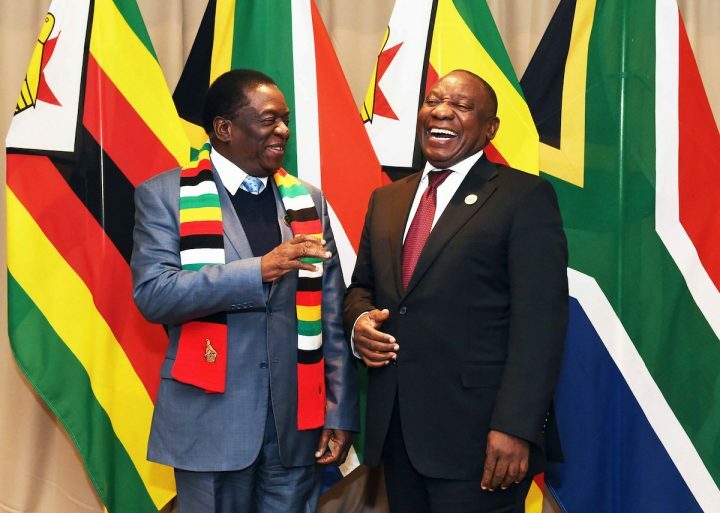 Mnangagwa claimed “the beginning of a new and unfolding democracy,” inviting many to speculate about whether governance in Zimbabwe would improve. There was some optimism, both in Zimbabwe and abroad. However, it proved mostly misguided and premature, given regime elites’ aversion to transitional justice. In countries like Zimbabwe, failing to account for the past and guarantee non-repetition of abuses makes democratization exceedingly unlikely. And, Mnangagwa’s and his collaborators’ actions over the past nine months suggest as much. Transitional justice can be broadly defined as justice adapted to societies in transition from profound and sustained political violence. Accounting for political violence, and establishing a historical record from which political actors cannot deviate, has tremendous consequences for national politics, such as which political parties perform well, whether violence recurs, and to what degree human rights are respected and the rule of law is maintained. Transitional justice has four main pillars—truth, justice, reparations and institutional reforms—which collectively help create a foundation for democracy, human rights and the rule of law. In my previous article, I identified perhaps the most consequential failed attempt at transitional justice in Zimbabwe in the mid-1980s and that forewarns that there will not be substantial improvements to governance without some degree of accountability for violence ordered and executed by Mugabe, Mnangagwa and company. In 1983, a truth commission was established to account for Gukurahundi, a repressive campaign which resulted in the killing of an estimated 20,000 people in Ndebele-majority Matabeleland. Mnangagwa claims he was not directly involved, despite being minister of state security and head of Zimbabwe’s Central Intelligence Organization (CIO) at the time, and despite himself promising to kill the so-called “dissidents” and destroy their organizational infrastructure (The Chronicle, April 5, 1983). These contradictory narratives are made possible in part because the truth commission’s report was never released. Contradictory narratives obstruct a public acknowledgement of harm, reparations for victims’ families, criminal accountability for perpetrators, and institutional reforms—the last of which may be most consequential for Zimbabwe at this point in its history. Institutional reforms can help advance democracy following authoritarian government. Three kinds of reforms are especially important: legal reforms, personnel reforms and electoral reforms. Legal reforms may include changes to a country’s Constitution, such as reshaping and constraining the powers, privileges and immunities of the executive. Personnel reforms can involve removing from office persons who have directed, participated, or been complicit in human rights violations and other abuses. Electoral reforms may involve installing term limits, creating an independent electoral commission and using monitors. However, none of these reforms are likely to be delivered because they would threaten those currently in power. First, in terms of the law, the Zimbabwean Constitution provides for presidential immunity from civil and criminal proceedings, which the military honored for both the former president and first lady. Mnangagwa is counting on immunity from prosecution should he ever find himself in the Mugabe’s position. Second, with respect to personnel, there is a long and established record of regime insiders enjoying both de jure and de facto amnesty, a practice that is being applied to coup leaders and which bolsters the dominance of ZANU-PF and the power of the military. Third, regarding elections, domestic and international audiences have come to expect sham elections that are swiftly followed by acts of violence, and intimidation of opposition leaders and their supporters. The July 30 elections were no exception. Despite the presence of international election observers and a captive global audience, the first post-Mugabe elections failed to be credible, free and fair, and do not reflect the general will of the people. Though Mnangagwa has been declared the winner, the MDC Alliance opposition party claims foul-play and that its candidate, Nelson Chamisa, is the real winner. Disturbingly, the elections have been marred by violence directed at leaders, members, and supporters of the MDC Alliance. Scenes of tear gas, live ammunition, and bloody corpses in the streets of Harare hearken back to previous episodes of political violence designed to maintain regime and party power. Activist groups have documented arrests, abductions and beatings, as well as harassment, including raids onto private property. With many in the opposition now forced into hiding, politicians and commentators warn that repression has gone—and will continue to go—from bad to worse under Mnangagwa, making prospects for democracy, human rights and the rule of law dimmer than ever. The events of the past year, and especially the last week, reveal that the Mnangagwa administration will extend, if not intensify, kleptocracy, corruption and repression as practiced during the Mugabe administration. A lack of truth, justice, reparations and especially institutional reforms typified the Mugabe regime, made possible the rise of Mnangagwa, and will continue to strengthen his and collaborators’ grip on power.